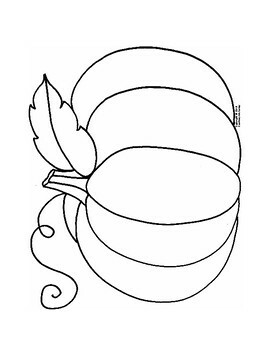 This simple pumpkin coloring sheet can be used for so many different things. Even though this pumpkin was originally drawn to allow students to practice their different types of line, it can be used simply to color in or to write all the things they are thankful for. This would also make a great pointillism art piece by allowing your students to dip q-tips into paint to dab on! The majority of the pumpkin can even be cut out (with the exception of the vine) and pasted to a piece of colored paper for a fun background. You could even glue on yarn or a pipe cleaner to add a textured vine! So many different ways to use this pumpkin coloring page throughout the fall season!